This piece was turned up from Tyrells End Farm. It is of entirely indeterminate age. 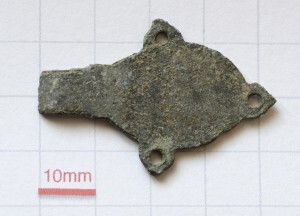 It looks like a broken part of a latch from a box or clasp from a garment, perhaps a belt. Click on any of these images for much larger versions. This can be thought of as the front of the latch. The left hand end used to bend up, perhaps into a hook, and has broken off.The raised bar across the neck of the piece is the only decoration anywhere. Because that is raised, it doesn’t seem possible that the latch was stamped out of flat sheet by the million with a modern process. The image below is the “back”. It’s flat. Was the latch cast from molten metal? 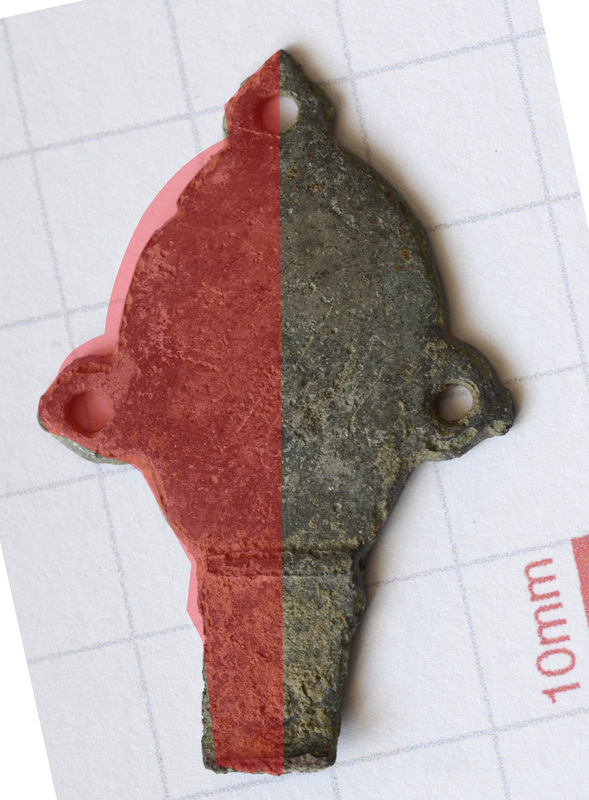 The image below is the detail of the break and the raised bar decoration seen from the front. This picture was taken with flash and the others in natural cloudy sunlight, so the colours aren’t directly comparable. The surface corrosion at the break is a different colour from the surface corrosion elsewhere. Does that mean the piece is plated? 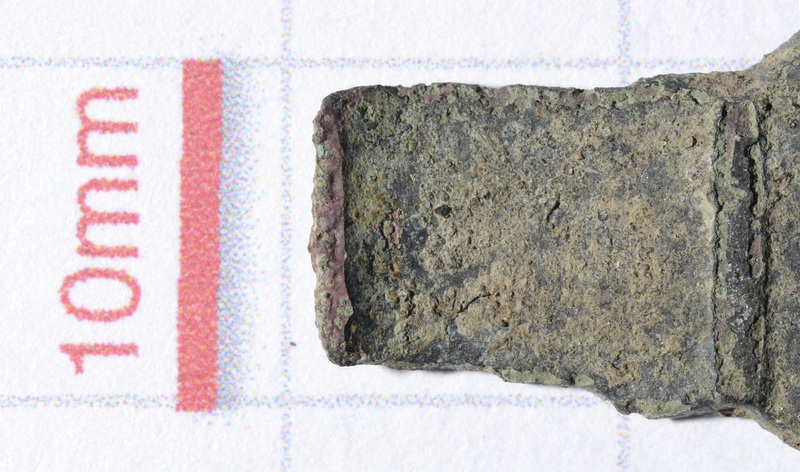 The metal at the break looks rusty, but it’s hard to believe that the core of the piece is iron, because it would quickly rust away. Looking at this image, it’s not so clear that the raised bar across the neck is actually a cast detail. 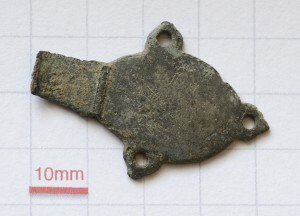 Is it where some other metal object was in contact with this piece for a long time in the ground? The surface looks corroded in that area. It would help if someone who actually knows what they are talking about would comment…! The piece exhibits considerable asymmetry. The image below shows the right hand side mirrored and moved over the left. So it doesn’t look like it was made by any particularly industrial process where the asymmetry would have been soon ironed out. Any ideas? Add your own comments below!